A good time was had by some. Overall, 36 percent of professionals describe holiday parties as entertaining; a nearly equal percentage (35 percent) give these events a thumbs down. To party, or not to party? Slightly more than one-quarter (28 percent) describe year-end bashes as obligatory; 47 percent view them as optional. Few are raising crystal flutes or the roof. Sixteen percent categorize their soirees as lavish or rowdy. East coasters are the best hosts. New York and Miami have the most fun parties. They're keeping it lively in L.A. Los Angeles has the most boisterous parties, followed by Austin and New York. See and be seen. Workers in Los Angeles and Phoenix feel the most pressure to attend holiday work events. When it comes to office holiday celebrations, not all parties are created equal. 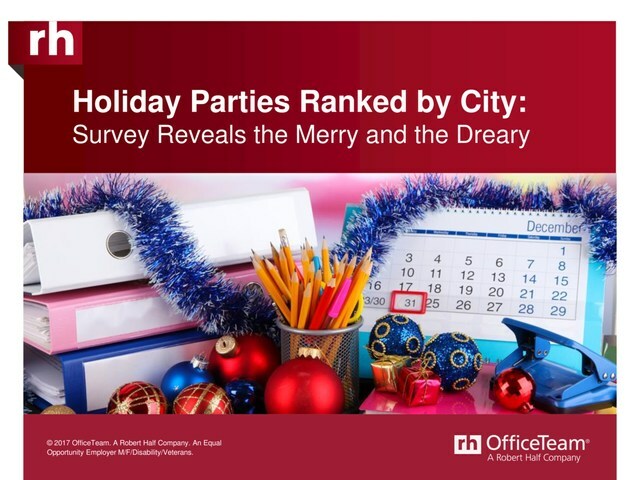 In a recent survey by staffing firm OfficeTeam, workers from 27 major U.S. cities were asked to describe their company holiday parties and rate them on several factors. While 36 percent of overall respondents describe these celebrations as fun, the results show that attitudes on holiday festivities vary considerably by city. Black-tie galas and festive ice sculptures may be a thing of the past — only 16 percent of workers polled said they'd categorize their company holiday parties as extravagant. The Big Apple hosts the most lavish soirees, the research found. Professionals aren't necessarily counting down the days until their company shindig. More than one-quarter of those surveyed (28 percent) described their holiday parties as obligatory. Brandi Britton, a district president for OfficeTeam, advises workers not to skip out too fast. "A holiday party is a time to build camaraderie with coworkers and visibility with executives you may otherwise not typically have exposure to," said Britton. "Getting to know people on a more personal level can also make work more fun." Mix and mingle. Socialize with coworkers outside your usual circle. These celebrations are an opportunity to meet people you don't work with every day. Curb shoptalk. This is your chance to get to know colleagues in a social setting, so don't make it all about business. Conversation starters can include people's holiday plans or New Year's resolutions. Build a buzz. Get the word out early. Talk up the event with management in all departments, and don't shy away from reaching out to employees individually. Don't be a scrooge. Though holiday time can be stressful for some, keep your discussions positive and upbeat. Avoid controversial topics such as politics and gossip. Get creative. A big budget isn't the only way to throw a successful holiday party. Brainstorm unique ways to build camaraderie without breaking the bank. Limit libations. 'Tis the season to party, but not too hard. Drink in moderation and remember holiday parties are still work functions. The survey of workers was developed by OfficeTeam and conducted by an independent research firm. It includes responses from more than 2,700 workers 18 years of age or older and employed in office environments in the United States.